Jeremy Heimans, Co-Founder and CEO of Purpose and Henry Timms, Executive Director of 92nd Street Y (introduced by Korenna Wilson of the LOR Foundation) spoke about “new power” frameworks and how social good communicators can leverage this way of thinking. Jeremy Heimans: So, we’re going to talk to you today about power and how power is changing and what it means for the organizations that you work in and what it means for all of us at a pretty critical inflection point. To start, we’re going to start with a bit of a downer. We’re going to start with Harvey Weinstein. Henry Timms: So, we think about for a moment how Harvey Weinstein exercised his power. His power was like a currency. He had it, you didn’t, he spent it down, he could start and stop movies, he could start and stop careers, he could start and stop rumors. For decades he literally held an industry in his hands. There was a survey done of the people who have been thanked the most times from the stage of the Oscars. In first place, jointly, was Harvey Weinstein and God. Jeremy Heimans: So, think though, we’re going to lift your spirits now. Think though about the MeToo movement. You think of Harvey’s power as power as currency, the MeToo movement could be thought of as power as current. So, it’s something that gets stronger and stronger the more voices are added to it. In fact, the enabling element of MeToo is that one person’s testimony makes it easier for the next person to stand up and speak up. It surges like a current in that it moves around the world from industry to industry and as it does it changes shape, new leaders emerge. It’s a fundamentally different form of energy and one that is produced very rapid social, cultural, and political change. So, next story, Barack Obama. Henry Timms: So, we all remember the enthusiasm, we are the change we are waiting for, the micro-donations around the country. People grabbing this campaign and making it their own. This extraordinary movement that Barack Obama built up to push aside Hillary Clinton and to unexpectedly end up in the White House. But perhaps one of the critiques of the Obama presidency would be although a movement got him into office, he then left that movement behind. Jeremy Heimans: So, you can think that movement he built did not move without him. The participatory energy of his campaign was missing, so after eight years he was handing the keys to the White House to, not his successor, but Donald Trump. The party he led was not as strong in many ways as it was when he started, despite the fact that Barack Obama was enormously personally popular at the end of those eight years among the people who had elected him. Jeremy Heimans: The next story is about a Scottish schoolgirl called Aqsa Mahmood. Henry Timms: She’s seventeen years old. She lives in Glasgow. She loves Harry Potter. She’s described as somebody who can’t find her way to the center of Glasgow on the bus, on her own. But in the evenings, she has been radicalized online. She becomes a bedroom radical. One day, she simply disappears. Three days pass and her parents are frantic and the phone rings and her mother picks it up. It’s Aqsa calling her and she’s on the border heading into Syria. She’s telling her that she has joined the Islamic state and she’s never coming home. But her story doesn’t end there. Jeremy Heimans: So, she gets to Syria. She becomes one of the most effective recruiters for ISIS. We studied her methods and she was very good at building this kind of very dark, girl-to-girl network that groomed other girls from the West and perfectly adapted this ideology to how you would get another girl from the West over to join you in Syria. There was a Tumblr with these memes and emojis that made it approachable, almost friendly. Here’s how to say goodbye to your family. Here’s what to pack when you’re coming to jihad. In doing so she was very effective at allowing this ideology to spread sideways. We contrast that to the US government when they first faced the threat of ISIS in the propaganda wars. Henry Timms: The first thing that the US government does when they are trying to out-message Aqsa and people like her is they fly airplanes over Iraq and Syria and out of the back of those airplanes they drop paper cartoons. The cartoons show you how bad life will be if you become a jihadi and those float down on to the heads of the civilian population. That tactic, a hundred years old, doesn’t work. So, they embrace social media and set up this Twitter account to dissuade potential jihadis. So, think again turn away, hopefully in English, with the biggest possible State Department logo you can find. Jeremy Heimans: We all know potential jihads are just huge fans of US foreign policy. Henry Timms: This does not work super well. So, three stories we’ve told you. We’ve told you a story about the MeToo movement and the way it swept away people like Harvey Weinstein. We’ve told you the story of a president who has an extraordinary surge of mobilization to get into office but then he leaves that crowd behind. We’ve told you a story of a seventeen year old schoolgirl essentially with no resources, who out-messages the limitless resources of the US government. These three stories point towards the underpinnings of the work Jeremy and I have been doing. Which is to say this, the way that we understand the future isn’t through understanding how technology is changing but rather how power is changing. Jeremy Heimans: So, you think about what Bertrand Russell said when he defined power. Power is the ability to produce intended effects. We argue that all power and new power are just two very different ways to achieve those effects. So, Harvey’s methods, right, power as currency. This ability to exploit the fact that there is something that you know, that you own, that you control, that nobody else does. So, you’re reliant on these dynamics of download and capture. You’re reliant on a system that is closed. The new power word relies on very different dynamics. Henry Timms: So, think of the new power world as these dynamics when power is made by many. It uploads, doesn’t download, it shares, it doesn’t command, it’s the power of the current. It flows and it surges, you can never quite own it but if you can shape it in the right direction, you can get to the outcomes you’re looking to find in the world. Jeremy Heimans: Here’s another way to think about the difference between old and new power. What’s this? Jeremy Heimans: Perfect age group for that. So, Tetris, the number one video game of the 20th century, right? The most popular video game in the 20th century. Henry Timms: It’s probably the most popular game of all time. Jeremy Heimans: What was that? Henry Timms: It remains the most popular game of all time. Jeremy Heimans: You think about the dynamics of Tetris. It’s the perfect metaphor for all power. These blocks are falling on your head. Your job is to sort them out into neat rows. The blocks get faster and faster and faster until they eventually overwhelm you. You are a cog in a wheel, you have very little agency in that system and ultimately what you learn is that you can’t beat that system. But contrast that to the number one game of the 21st century. Henry Timms: This game is Minecraft. So, Minecraft, if you don’t know it, is block-based like Tetris. It’s a block based game but the dynamics are very different. There are no rules to Minecraft. Nobody else sets the stage of how you play. It is literally a game built from the bottom up. It is collaborative. It is co-creators, players from all around the world come together and they decide what they want to build and they build it on their own terms. So, if you enter the world of Minecraft, you’ll find houses, you’ll find churches, you’ll find synagogues, you’ll find working computers, you’ll find fantasy worlds. This incredible, extraordinary, emergent world is being unveiled by people who think not in the old power way, which is we wait for the blocks to drop on our heads so we put them into lines. Instead, a generation of people are coming into the world expecting to co-create. Jeremy Heimans: So, that sort of brings us to this clash of values that we see playing out all around us. You think about being a kid who’s growing up in that Minecraft world and how different that is in terms of what you’re learning about your role in the world, your expectations around participation, your relationship to rules and institutions. You start to see how this clash is playing out. We see this all around us. On institutions all the data shows this growing distrust of those institutions. Part of that is because these new power values are preferring these more informal, more network forms of governments, people don’t have the patience for some of these formal structures. They are used to a world that they’re getting instant gratification from the platforms in their lives where the institutions are unresponsive at best and hostile at worst. We also see this tension around transparency. Henry Timms: A lot of you work for organizations and you have constituents who come in expecting to know everything there is to know about the work you’re doing. How much everyone gets paid, what decisions are made, who makes them, how things work out. We seeing this real tension between a world where people expect a level of confidentiality. There’s a need to know basis in the old power world that’s being very threatened in the era of WikiLeaks and leaks in general. Where this need and this desire for transparency is very much are part of a new power mind set. Jeremy Heimans: We see this playing out in all sorts of interesting and bizarre ways. There’s a politician currently running in the midterms, an independent candidate for governor of Arizona. This guy realizes that norms around transparency are changing. His name is Noah Dyer. So, he says, “I’m just going to preempt these dynamics”. So, he creates a section on his website called Scandal and Controversy. On that section, he preemptively discloses his entire sexual history. He says, “There are videos” and he says, “You know what, I wish everybody the same freedoms that I’ve enjoyed”. So, he sort of upends the dynamic that when we think about these roles, we think about this idea of how much we can protect. Instead, he’s thinking how much he can share. It’s a extreme example but it shows you how much things are changing. We also see this tension around expertise and mega culture. Henry Timms: So, we remember during Brexit that the big line was, we’ve had enough of expertise and look at the polling data on experts and trusted experts, which is falling around the world and think about your own work. Think about the experts in your world and how they communicate. One of the things we think with this work is one of the key arguments Jeremy and I make is not that old power values are all bad and new power values are all good. That is not our argument. In fact, expertise seems to us matters more than ever. You think now about the threat to the set of kind of enlightenment values that were our bedrock, belief in science, and belief in reason All the things in which underpin so much of your architecture of our society and now in threat. One of the great dangers of our time is experts have been left on the sidelines cause they aren’t able to communicate in a new power world. Some of the smartest people we know are still entering the battle for ideas armed with nothing more than a white paper and an annual symposium. Jeremy Heimans: Not ComNet to be clear. Henry Timms: The other thing I want to say. Jeremy Heimans: Exactly. It’s the annual that really. 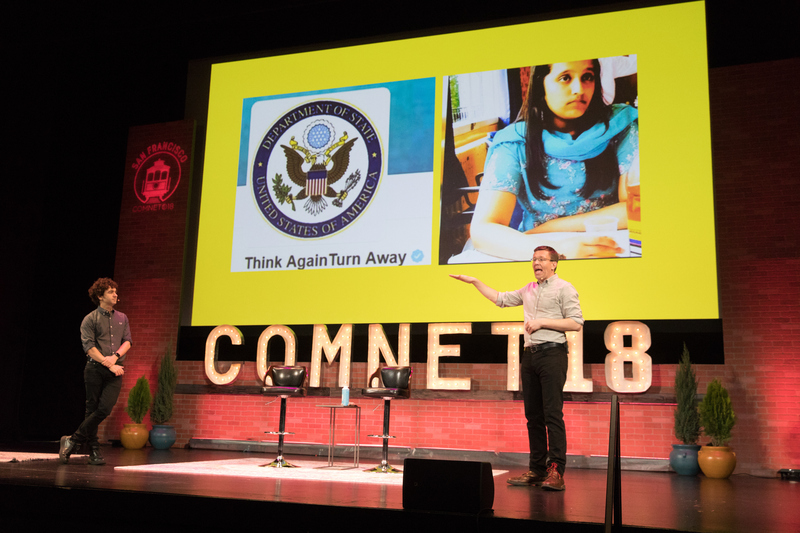 Henry Timms: Well, ComNet is just 365 days a year. Jeremy Heimans: Well, exactly. Finally, I think this is very relevant to many organizations in the social sector, how affiliations changing requires very significant rethinking about models in the social sector. Because people are not card carrying members of organizations. Because people today tend to be more affiliative but less loyal and less enduring in those patents of affiliation. So we see these dynamics playing out all around and it kind of led us to this framework. We first sort of run these ideas past the world in Harvard Business Reviewer, in an article a few years ago. Everyone who’s ever read Harvard Business Reviewer know you basically have a contractual obligation to do one of these two by two metrics. Henry Timms: So, we did one. So, what we’re tracking here, on the vertical axis we’re looking at models. So, do you have an old power model or a new power model? Is your model like Tetris, where you kind of drop things down and people consume them or is your model like Minecraft, where you create this space for participation and collaboration? Along the horizontal axis, we’re tracking values. Do you have old power values, like confidentiality and expertise and managerialism, or are you move towards new power values where you believe in more collaboration, more openness, more transparency? Jeremy Heimans: So, we’ll take a quick tour of the campus over here. I’ve discovered, by the way, the laser. This is the first time I’ve used it. I’m like a small child. The castles quadrant. These are many of the organizations that we recognize from the 20th century. The organizations that are still rooted in old power but we also see interesting companies like Apple. We draw our attention to Apple for an important reason. Firstly, Apple is a technology company but deployment of technology does not equal new power. If you think about Apple, it’s business model, it’s core model is really this idea that there are these product designers in California who know what we need before we know we need it. You think about the relationship Apple asks us to have with them. Have you ever noticed those Apple store, the Apple is where the crucifix is and it glows. The orb, the glowing orb. It asks us to worship Apple but it does not ask us to engage or participate the way some other brands we’ll talk about do. It’s a secretive company. It doesn’t do collaborations particularly well. That brings us to the cheerleaders. Henry Timms: So, the cheerleaders are organizations who still have an old power model but are beginning to adopt new power values. Let’s think for a moment about The Guardian newspaper. It was launched to help repeal the Con laws in England. A very old power model but they are beginning to adopt new power values. So, if you’re reading an article in The Guardian, half way through you’ll be promoted to take action on whatever the issue happens to be. The Guardian now has one of the biggest databases of police killings in the US put together by its own readers. Now, they’re actually making more money out of their readers becoming members and advocates and supporters then they are making out of their traditional advertisers. So, they’re beginning to give their reader a role, which is a much bigger role than simply reader. Jeremy Heimans: So, moving out of the crowds quadrant. New powers models, new power values. One type of crowd model that we see in that top right, are these new decentralized social movements that don’t even look like institutions. There isn’t a door you can knock on in the case of Black Lives Matter or MeToo that really represents the movement as a whole. I think one of the imperatives for organizations like yours is how do you actually develop an effective relationship with those movements. How do you harness that extraordinary energy? How do you learn to play relay with those movements so that energy can be turned into policy and power with some of the skills that this group represents? We don’t see enough of that relay today. You also see models Airbnb. These are model that are quite skillfully building community around a new power model. So, Airbnb, just a couple of days ago said, “Oh we’re filing with the FCC because we want to give equity in the company to our most engaged hosts”. This is a very smart business strategy for them and part of what that reflects is that they, as in new power model, have decided to invest in trying to create a very symbiotic relationship with their base. That’s in contrast to the co-opters. Henry Timms: So, the top left is those organizations with old power values but new power models. So, think for a moment about Facebook. One of the most effective new power models, you can imagine, in terms of participation and engagement. There would literally be no Facebook were it not for the daily contribution of your data that you make to their model. The values are actually very old power values. Very closed up system. The algorithm, which shapes our lives, our choices, our politics, is hidden from us and for all of the openness and connectivity, the values actually extracted by a very small number of people. So, that’s the co-opted on the top left. So, we are not going to have a session on new power and simply talk at you for 45 minutes. So, we are now going to ask you to meet your neighbor and with your neighbor, for the next four minutes, answer this question. Where are you as an organization, right now? Your organization right now, where are you on this. I hear some giggles. Jeremy Heimans: The uncomfortable laughs. Henry Timms: Let’s be transparent. Where are you now and where should you be in five years? Jeremy Heimans: Where are you now and where should you be? Jeremy Heimans: Okay. Old power time. Old power. Henry Timms: This is the great danger of letting the crowd take over. It’s out of control. It’s gone off the tracks. We’re gonna have to impose some old power. Henry Timms: Let do a quick survey. Hands up for who currently thinks of themselves as a castle. It’s going viral. Quickly going across the room. Okay. I’m going to predict that’s about 30%. Some very enthusiastic castles, very proud castles. Alright, we got castles there. Who currently sees themselves as a cheerleader? Henry Timms: Do we have any crowds in the house? We have one solid tree. Jeremy Heimans: Who is a co-opter? Henry Timms: Do we have any brave co-opters? Alright, great. Jeremy Heimans: Yeah. Good. You guys are clever. Slightly evil but clever. Should we do the vote now on where you want to be in five years. So, who wants to be a castle in five years? I was expecting the co-opters to go, “We want to move down to the castle”. Who wants to be a cheerleader? Okay. Smart. Who wants to be a crowd? Great. And who is moving into that co-opter space? Excellent. Henry Timms: So, everybody wants to move and we’re going to tell you a story now about an organization who tried to make the kind of move we are all going to make in the next five years. This is a story about an organization who tried to embrace new power but it didn’t quite work out. Jeremy Heimans: I love this story because it makes the English look ridiculous. Sorry, Henry. This is a story of a ship that a British research institution, NERC, had built. It’s a big maritime shipping vessel, very proud of it. It was going to sail the world to do environment research and they thought, “Why don’t we engage the public by asking them to name this ship”. Henry, tell me what happened. Henry Timms: Well, it didn’t go super well. So, they issued their press release, their campaign, they’re ready to go. They hoped that they public, the press release said on it. Again, quick tip, there aren’t many good social media campaigns that began with press releases. So, the press release comes out, it says #nameourship. It says perhaps you’d like to call the ship something like Endeavor or Shackleton or Adventurer. The great British public, the witty, extraordinary, great British public did not want to call this boat Shackleton or Adventurer. Instead they came back with this. Jeremy Heimans: Boaty Mcboatface. It literally swept the world. Their website crashed, hundreds of thousands of people voted for this. Henry Timms: I do want to say, just in defense of the fine people of Britain, RRS I like big boats and I can not lie. Jeremy Heimans: That seems very American. That was the Americans invaded the boating. Look, this was a debacle but it was also a massive moment. This was the peak of public interest in maritime science, ever. The problem was, they were basically all over the international press. There was a lot of excitement, a lot of joy, it felt very English and yet the science minister was not happy. As the debacle unfolded, the guy who came up with the idea said this. Henry Timms: But then the great British public emerges again against him and surges and said stop apologizing and he retraces his apology the next day. Jeremy Heimans: They literally hold a parliamentary inquiry into this, which is what the British do when things go wrong. They called in an expert to testify who is an expert in crowd campaigns and at the end of the testimony the parliamentarian says, “Thank you for your testimony sir, just out of curiosity, who did you vote for?” And he says, “Boaty Mcboatface”. So, the question is, what does an organization like this do in a situation like this? Henry Timms: So, here’s our second poll of the day. You have these two forces coming at you, on one hand you have the new power of the great witty British public that want Boaty Mcboatface, on the other hand you have your boss, you minister, your funder, who is saying you simply cannot spend $300 million on Boaty Mcboatface, put this back in its box. So, here is your question. Lets to a show of hands. Who is going to keep the name Boaty Mcboatface? Alright. Jeremy Heimans: Absolutely. Have you guys all lost your jobs? Henry Timms: And who is going to find something new? Who is going to abandon Boaty? Okay. This is very good. So, you’re fully-employed for the future. So, they get caught between old power and new power and of course this is funny story but it makes a serious point. One of the dangers of this organization, they face the danger we see again and again with institutions, which is they see new power as some kind of stunt they can do once in a while and they actually don’t take it seriously enough. So, we see four things that we can all think about. If you’re thinking about how you can use new power in your own work, there are four things we think that stand out. Jeremy Heimans: So, this is a framework we lay out in the book that helps organizations think about when and whether to turn to new power. These are question that perhaps NERC should have asked before they launched this campaign. The first question is about strategy. Do you actually need the crowd here to get a better outcome? Do you have something of value to bring to the crowd or are you doing this as a stunt, as window dressing? The second question is about legitimacy. Henry Timms: Do you have legitimacy with the people who you’re trying to engage with or are you entering a space that really isn’t yours? There was a famous story shortly after the financial crisis, JP Morgan decided they were going to do a social media experiment and launched a campaign called #askJPM. Their hope was people would ask them questions like, would you please explain what a derivative swap is? Of course they asked questions like, how do you sleep at night and how do you feel about having brought down the global system? Jeremy Heimans: The third question is about control. The fallacy in this work is thinking that in order to use new power you have to give up all control. That’s really not true. It’s actually about whether you’re welling to see control around perimeters you set and design carefully. The perimeters were not set appropriately for the boaty campaign. With that then you do need to be willing to accept a range of outcomes. If you’re looking for a very specific outcome don’t ask people but accept outcomes that are unexpected or suboptimal within perimeters you’ve set and you start to really get the benefits of unleashing people’s agency. Finally, there’s commitment. Are you in this for the long term. If this is episodic, if this is a stunt then people’s agency you’ve engaged could really be left more disappointed and disengaged after then if you did nothing at all. So, where does that leave us? Henry Timms: As we think about our world and our sector. If you’re looking for the one key message, and perhaps the call to action of our book, is the future is a battle for mobilization. I think now about this era of mass participation. We look across the world and you see the climate deniers are often out mobilizing the climate scientists. Just this morning there was new data showing few parents are vaccinating their children. The anti-vacciners are out messaging the health officials. Those voices on the side of reason are being drowned out but people who can mobilize more effectively and more intensely than the people of the side of the angels. Jeremy Heimans: So, as funders are, and even as large as non-profits, the question is are you actually investing in new power? There’s a temptation in our current culture to focus on technocratic solutions. Things that are easily measurable, that have the veneer of precision. But actually some of the most important work you can do is work that is actually investing in giving other people the ability to effectively advocate. So, we think there is a huge underinvestment in new power and movements, in advocacy in this sector. These would be those technocratic solutions. Really what that means is that if you’re a funder, you hear a lot about this idea that people these days are spending down their endowments, but what about the experiment of spending down your own power. Of doing work that makes you less powerful at the end of that work because you’ve actually conferred more agency on people that you’re serving. That’s a very different power dynamic and it’s one that I don’t think we see enough of. Henry Timms: Finally, one of the things that we’re beginning to see more and more as an implication is the most effective actors are those people who can bring together both old power and new power. One question for your own organization is are you able to deploy both old power and new power? I think for a moment about the NRA. The NRA has a terrific old power strategy. They have this feared brand. Politicians will change their votes in advance of that brand turning on them. The NRA actually gives politicians grades and politicians live in fear of being downgraded by the NRA. Henry Timms: It’s extraordinary old power but what people often don’t see is that next to that old power brand, they have this new power eco system of local gun groups, of local activists, of community groups. Which often don’t have the NRA logo but they carry the NRA’s mission. What happens is when these moments come, we’re still in a world where 90% of people believe in sensible gun control in this country but when these moments of inflection come, those people are often out voted but the intensity of the NRA’s machine because their new power and their old power combine. So, as we look to the future of the gun battle, one of the answers we want to point towards is how the other side of this battle get good old power and new power. Jeremy Heimans: So, that really brings us to this question of how do you actually put new power to work? We want to run you through a few steps that are particularly relevant to movement building. The first of those steps is about this fight on guns. We were involved at Purpose, the company I run, with starting this organization called Every Town. Every Town is an attempt to build a counterweight to the NRA. That requires a blend of both old and new power. When we were starting that organization it was mom’s who were the nucleus of that. We called then the connected connectors of that movement. They were connected to each other. They were deeply networked with each other and they were connected to the world. They really powerful spokespeople. There was nothing like the moral authority of these moms who organized after the Newtown massacre, who said, we have just had enough of feeling that our kids are unsafe when then go to school. They were protesting outside of Target against open carry and those women became the powerful nucleus of the beginnings of a counter movement. Jeremy Heimans: Secondly, you need to build a new power brand. That same organization, when we started that work with Michael Bloomberg’s group, his group was called Mayors Against Illegal Guns. While that’s a really important organization that wasn’t very open to participation. We have to construct a brand that anyone could join and we have to construct something that felt like it was part of every community, which is why we called the organization Every Town. We see the same principle applying in a bunch of other context. Henry Timms: So, you think about the Airbnb, when Airbnb rebranded, they intentionally created something that could be shifted and changed. They created a brand with the goal which they even put together tools where people could adapt Airbnb’s brand to tell their own story. We also followed this strategy with Giving Tuesday. I’ll give you the quick plug now on Giving Tuesday, November the 27th this year, has become the first global day of giving. The brand guidelines for Giving Tuesday don’t exist. What we said was, people can grab this and make it their own in whatever they want to. So, Giving Tuesday has become Giving Shoes day, where Dress for Success worked with women to take office shoes and clothes going back into the workplace. It’s become giving blue day, where the University of Michigan raised over $5 million last year. So, the brand itself is able to shift as it morphs around the world. So, you can see now, every country involved around the world with no brand guidelines has taken this and made a brand in their own sense and their own character. That’s what a new power brand does, it leaves space for other people to brand you, not for you to brand your constituents. Jeremy Heimans: I think what’s so smart about Giving Tuesday was the intentional decision to make it ownerless. It came out of Henry’s group, the 92nd Street Y, a big cultural, institutional organization in New York but they really intentionally said we’re not slapping our brand on this, we’re giving it to the world. That decision is absolutely critical to the reach that, that has had. Jeremy Heimans: The third step is about making it as easy as possible to get involved. This is a story of an Indian anti-corruption activist who figured out that the most easy way to get people in the door was to ask them to leave a missed call. Which is a widespread practice in India, where people basically call each other and hang up in order to save the phone charge but to say I’m running late, or I miss you. It’s a very funny cultural context where the way you say to your lover that you miss them is by hanging up on them. And he got 35 million of those missed calls. He then took that frictionless beginning and did this. Which is move people up the participation scale. Henry Timms: One of the things people often think is these low level actions don’t add up to much. They’re slacktivists, they don’t really care, they’re not really invested but they’re often something else. They’re entry points into much more participation. So, think about something like, TED, as a model. TED used to be just a conference where people would come and pay money and they would just have no role apart from just sit and watch. What TED did so well is that they gave people more roles to play in their movement. So, if you believe in TED, you can of course go to their conference but you can also create your own conference. You can translate your favorite video. You can share it with your friends. They’ve created this architecture of engagement around their brand that pushes people up that path so they are co-owners of the TED brand. Jeremy Heimans: Finally, movements are all about moments. There’s a skill around deploying those moments in order to mobilize people and to build something that’s sustainable. In the book, we identify three kinds of moments. We call them the three storms. The first of those is storm-creating. Henry Timms: So, think about Nike’s decision to launch the Kaepernick commercial the day before the first day of the season. This was long planned. This was behind closed doors. They were very intentionally deciding to drive this intensity around this moment and their brand has benefited in the tunes of billions of dollars since that moment has come. They were able to decide to create a storm. The second thing is though isn’t just are you able to create a storm when you choose but what you do when they come along. Jeremy Heimans: So, this was a campaign that we ran in New Delhi. There was a moment in Delhi, a couple of years ago, where the population got so bad that people literally couldn’t leave their homes or go to school. So, very quickly, this Purpose climate lab put together this campaign called Help Delhi Breathe. It was a movement that took advantage in a very short period of time, an advantage of this extraordinary storm. The kind of heart of that movement was training rickshaw drivers. So, in Delhi, rickshaw drivers are the people who drive around the city, they’re iconic in the city, training rickshaw drivers to talk about air pollution with the people that they rode. It really changed the conversation in a very short period of time because of the intensity of that moment the Delhi government, within 72 hours, announced the most ambitious solar policy at any level in India. Finally, storm-embracing. Henry Timms: Sometimes things come at you and the question is what you do with them. This is a group at a local chapter of the Girl Scouts in greater Washington was often hundred thousand dollars from a donor. The donor said, “Here’s your hundred thousand dollars, just one thing, none of the money can go to transgender girls.” To their great credit, they not only sent the money back but they launched a campaign called #foreverygirl. Which reaffirmed what they stood for as an organization and the fact that they were inclusive of all girls. Of course, they raised $350,000. Jeremy Heimans: Very awesome. So, where does this leave us all? We had this major historical inflection point where this new power is so strong, it’s so powerful, but as we’ve described today, it’s also been co-opted by some of the world’s worst actors. We think that the imperative is how can we all use new power to actually help the least powerful? This is an example of a campaign that we ran in Syria. Building a movement around Syria is really difficult. Jeremy Heimans: Several years ago, there was very little Western public interest in Syria, despite the fact that hundreds of thousands of people who had already been killed. This was a time when aid levels were depressed because governments didn’t have an incentive to really do that. There was no real refugee resettlement happening. So, the work was to try and find a way to inspire people and mobilize people around something that felt very distant from. The way that we did that was we found a group of heroic civilians inside Syria who were pulling people out of the rubble after the barrel bombings. We decided to figure out how to tell their story and then to build a movement around that story. This is that story. Jeremy Heimans: So, that is just one story, it’s just a video but off the back of that we started to build a movement around these incredible folks, the White Helmets. Millions of dollars were raised in crowdfunding and tens of millions of dollars ultimately was raised to help these guys do their life-saving work and it changed the way Western governments thought about the Syria, landing it as a humanitarian crisis. This is that boy now. Here he is. He’s safely resettled in Turkey. I think his story is a message and a lesson for all of us about how we might start to use these very powerful tools to fight the fights that we face right now and all of you are facing that are so consequential. So, on that happy note, Henry. Henry Timms: So, there are two things we want to tell you about before we finish. The first, if you don’t know about it, is the Lipman Family Prize. We wanted to share this with you because it’s something that we’ve been very inspired by a friend of ours, Barry Lipman, put this together. Comes out of the University of Pennsylvania. It’s an annual $250,000 prize, the prize is actually underneath that, to support both innovation and leadership in the sector to take ideas, often driven by new power, and celebrate them and reward them in important ways. So, if you don’t know about this prize, it’s exactly the right kind of prize for the people in this room. So, do take a note of this web address and I encourage you to enter. I’ve sat on the judging panel before and it’s an extraordinary thing. Henry Timms: The second thing we want to bring to your attention is an experiment. So, Jeremy will click one more slide. Here is our experiment today. We haven’t done this before but it’s going to be an experiment in collaboration and transparency. So, here is the experiment in collaboration and transparency. We oversee, there is a book tied to all this new power, we put all of these ideas and all of these lessons in the New Power book. Obviously, we’re hoping people here today will buy the book, you can go onto Amazon right now. You can go to a bookstore today and buy too. We’re going to go a step further today which is to say this, if you buy the book today or if you bought the book already, or if you have a book in any way, we would love to send one to someone who you think would enjoy the book. We will then pay for a book to go to somebody else and the only thing you need to do is email one of us and just send us the address of the person you’d like the book to go to. You don’t need to prove you’ve already bought the book, we’re going to trust that that’s true. This is an experiment in seeing how the book can be shared in interesting ways. Jeremy Heimans: They can’t be a member of the Alt-Right, just to be really clear. Henry Timms: But they can definitely be British. Jeremy Heimans: This is about the mission of the book. Which is how do we help folks that need to mobilize affectively around their values, do it better. Henry Timms: So, look, thank you. We want to finish by saying this, we count ourselves as fortunate to be a part of this community. This week, in a small way, think about the inconveniences and the displacements that this conference has had and has obviously conquered in so many ways. But much more broadly, we as a sector, we as a group of colleagues and professions face so many displacements, inconveniences and at the end of the day so many great challenges. The work that we do, we’re both so passionate about it because we realize the stakes of this work. Which is its people in rooms like this that need to master new power. So, as we head back to our workplaces and to our mission, I encourage all of you to grab new power and Let’s push it in the direction of making a better world for all of us. It’s a pleasure to be here. Thank you. Jeremy Heimans: Thank you so much.